Now’s the time to make the most of this most delicious vegetable grown so close to our shops. Only in season for just a couple of months it is a real treat of late spring. Wash the asparagus. You can trim and peel the outer layers of the ends of the spears if wished but this is not essential. Lay a bunch of asparagus spears out on a baking tray and drizzle with olive oil. Season with freshly ground salt and pepper and turn them over to coat each spear. Roast in a hot oven for 10-15 minutes. That’s it! You can add a squeeze of lemon, wine vinegar or balsamic. You can scatter over some shaved cheese, a hard sheep’s cheese is good. Excellent with some finely sliced ham or a soft boiled egg. 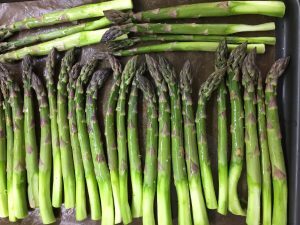 Cut the washed asparagus into short lengths. 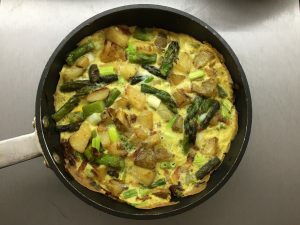 Fry some streaky bacon or pancetta in a little olive oil (bacon is optional) in a frying pan, when the bacon is beginning to brown, add some sliced cooked new potatoes, fry until also beginning to brown, then add the asparagus and stir fry until the asparagus is lightly cooked (about 5 minutes). Add a few sliced spring onions and turn a few times. Pour over 2-4 lightly beaten, seasoned eggs (depending on appetites), cook for a few minutes until the eggs are just set. You can either turn the omelette over in the pan (tricky) or put into a hot oven or under the grill to finish the top. Delicious hot, warm or cold and great picnic fare.